Option A: From the cloud. Option B: From the device (Android or iOS). Option C: From the drone. (Android) A project gathers missions. A mission is a flight. (iOS) A project is a mission. A mission is a flight. From the cloud it is possible to download the images, some outputs, the project file (.p4d) and the result folders to a computer. Note: Option A is only possible after synchronizing with the drone and uploading the flight project to the cloud. For more information: (Android) How to synchronize and upload the mission to the cloud (Android), (iOS) How to synchronize and upload a mission to the cloud (iOS). 1. Download the files from Pix4D Cloud and open the project with Pix4D Desktop locally. For more information: How to download results from the cloud. 2. Once the project is loaded, on the menu bar, click View > Processing. The Processing bar opens on the bottom of the main window. 3. Ensure that 1. Initial Processing is selected and that 2. Point cloud and Mesh and 3. DSM, Orthomosaic and Index are unselected. 5. Analyze the results and process further. For more information: Step 4. Processing. Note: Option B is only possible after synchronizing with the drone, meaning transferring the images from the drone to the device and generating the .p4d file. For more information: (Android) How to synchronize and upload the mission to the cloud (Android), (iOS) How to synchronize and upload a mission to the cloud (iOS). 1. Connect the device with a USB cable to the computer. 2. Open the device directory. 2.1. In the Windows File Explorer, click This PC. 2.2. In the section Devices and drives, double click the device. 3. Browse for the Pix4D folder and double click it. 4. Among the flight projects that are stored, select and copy a Project ## folder to the desired location on the computer. The global project file (.p4d). Mission folders containing the flights being part of the same project that are meant to be processed together. The individual file (.p4d), in case a specific flight needs to be processed independently from other missions. The respective captured images located in the data folder. 5. Double click Project ##.p4d to open it with Pix4D Desktop. 1.1. The iOS device should ask to trust the computer, click Trust. 1.2. The Mac computer should ask for the permission to access information on the device, click Continue. 3. Select the iOS device from the phone icon on the top. 4. On the left sidebar, select Apps and scroll down to the bottom of the window. 5. In the Apps section, select Pix4Dcapture. 6. In the right window, select Projects and click Save to... to export it to the desired location on the computer. The project file (.p4d) of the flight. The mission folder of the flight. The project file (.p4d), copy of the one above but with a different name. 7. Double click Project 000##.p4d to open it with Pix4D Desktop. Tip: There are alternatives to share the mission data without having to connect the device to a computer. (Android) The .p4d file and images can be shared by email or any suitable platform. For more information: (Android) How to share the mission data directly from Pix4Dcapture. 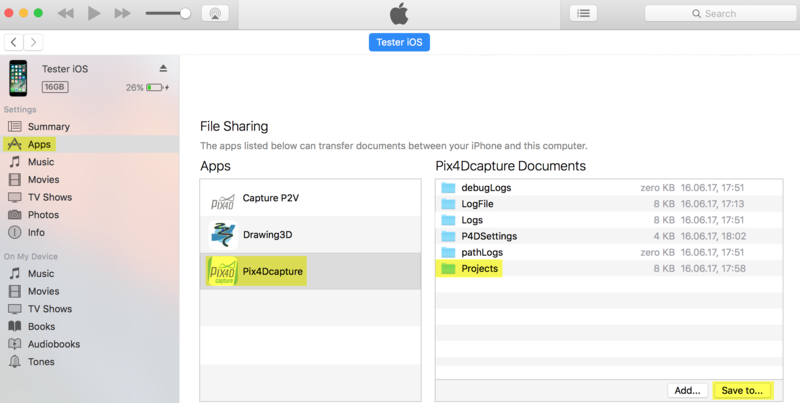 (iOS) The .p4d file can be sent by email using a specific option in the app. For more information: (iOS) How to transfer the mission .p4d file directly from the Pix4Dcapture. In this case, the images can extracted from the drone via Option C.
1. On the menu bar, click View > Processing. The Processing bar opens on the bottom of the main window. 2. Ensure that 1. Initial Processing is selected and that 2. Point cloud and Mesh and 3. DSM, Orthomosaic and Index are unselected. 4. Analyze the results and process further. For more information: Step 4. Processing. To copy the images from the drone/camera, no need to perform any post-flight action with the app. If for any reasons it is not possible to use the project file (.p4d), the user can still process the images by creating a project from scratch and import the images. Note: Option C is possible in any cases meaning that synchronizing the mission is not required. It is recommended to process the images using the .p4d file generated by the app (if available). However, processing with or without the .p4d file makes no difference in terms of results and quality of the reconstruction. For more information: (Android, iOS) Is the .p4d file required for processing?. (DJI) Take the SD card of the camera, insert it in an adapter and plug it into your computer. Alternatively, connect the drone to the computer through a USB cable. Make sure the drone is switched on. (B2) Connect the drone to the computer through a USB cable or using Wi-Fi. Make sure the drone is switched on. B2 has an internal memory but no SD card. 2. After installing the program (download link), start Pix4D Desktop. 4. The New Project wizard opens. If needed, a more detailed procedure can be found here: New project in Pix4Dmapper. Otherwise, follow the steps below. 5. In Name: Type a name for the project. 6. (optional) In Create in: Click Browse. On the pop-up Select Project Location, navigate to the folder where the project and results will be stored and click Select Folder. 8. In the window Select Images, click Add Directories... and browse for the folder containing the images. Click Choose. 10. In the window Image Properties, click Next. 11. In the window Select Output Coordinate System, click Next. 12. In the window Processing Options Template, select the appropriate template either 3D Maps or 3D Models. 13. Click Finish to end the wizard. 14. On the menu bar, click View > Processing. The Processing bar opens on the bottom of the main window. 15. Ensure that 1. Initial Processing is selected and that 2. Point cloud and Mesh and 3. DSM, Orthomosaic and Index are unselected. 17. Analyze the results and process further. For more information: Step 4. Processing.